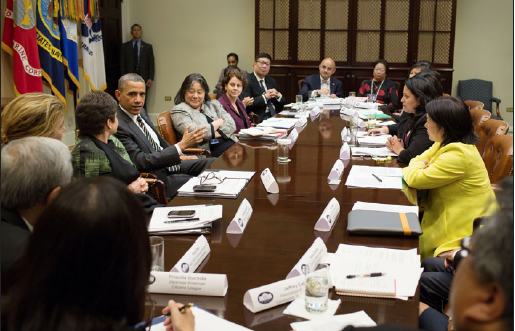 President Obama discussed immigration and other issues of concern to Asian American and Pacific Islander organizations. WASHINGTON — National leaders representing Asian American, Native Hawaiian and Pacific Islander organizations met May 8 with President Barack Obama to discuss immigration reform, access to affordable health care for all Americans, and civil rights protections. Priscilla Ouchida, executive director of the Japanese American Citizens League (JACL), participated in the meeting along with leaders from other national AAPI organizations. Obama discussed his call for common-sense immigration reform that will strengthen the economy and grow the middle class. He emphasized that immigration reform continues to be a top legislative priority and that he looks forward to working with the AAPI community to achieve that goal. The leaders expressed their support for the principles that the president and key senators working on immigration reform have laid out and their strong desire for a bill that provides a pathway to earned citizenship and supports family unity. The leaders also expressed their commitment to working with Congress to strengthen the legislation that is being considered. The president and the leaders also discussed a number of issues of importance to Asian Americans, Native Hawaiians, and Pacific Islanders, including efforts to provide affordable, accessible health care to AAPI communities. The meeting included senior White House officials and staff from the White House Initiative on Asian Americans and Pacific Islanders. Issues that were presented included the needs of low-income and limited-English-proficient individuals, bullying and harassment, federal recognition of native lands and immigrant integration, and the need to repeal provisions in the National Defense Authorization Act of 2012 (NDAA) relating to indefinite detention. Robin Danner is not the voice for most native Hawaiians in the islands for she is a obstructionist with our voice of concerns like blocking our voice for concerns with the Akaka Bill. She is currently engaging projects that are not the majority voice and consent of native Hawaiians in the islands.